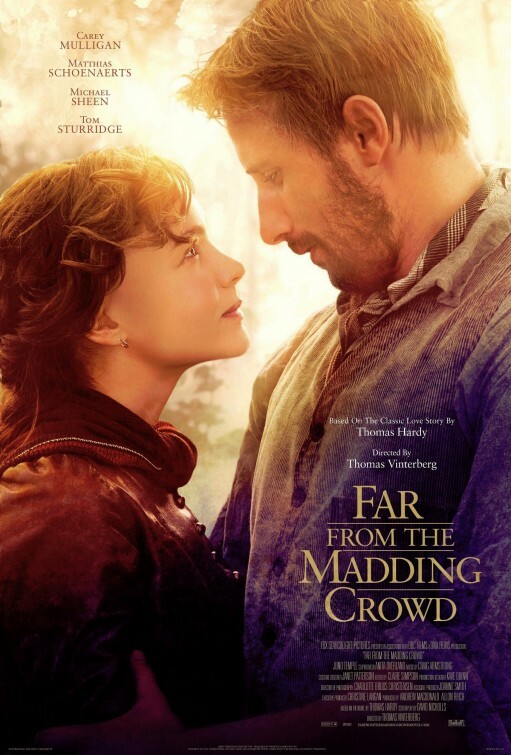 On Oct. 8, the Kamloops Film Society held a showing of Far From The Madding Crowd, the story of a Victorian love triangle based on the novel of the same name by Thomas Hardy. Carey Mulligan stars as Bathsheba Everdene, a woman more independent than most of her time, yet irresistible to most of the men she comes across. Beginning in 1870, Everdene inherits her uncle’s farm, and proves her worth in running it and contributing to the manual labour. Soon however, her romantic entanglements take centre stage. First is Gabriel Oak, played by Matthias Schoenaerts, a sheep herder who proposes to Everdene. Everdene turns him down because she dislikes the principle of having a husband, and hires Oak to work as a bailiff on her farm after his sheepdog drives his flock over a cliff. Oak is the constant, waiting in the wings and calling Everdene out for leading him on. Next is William Boldwood, played by Martin Sheen. Boldwood is a well-off, highly sought-after older bachelor, to whom Everdene sends a Valentine’s Day card on a whim. This sparks his interest, and he too proposes to her. Third is Tom Sturridge as Sergeant Francis Troy, a passionate and impulsive man, with whom Everdene has instant chemistry. They elope. Each of the male leads inspires sympathy, though some more than others. They are portrayed as real people, rather than caricatures, which happens with many a love triangle in film. The film is an ode to pastoralism, with gorgeous sweeping shots of horses running through picturesque countryside. Compared to a lot of other films out this year, this one is rather subdued, with most of the tension just below the surface. What distinguishes this film from being just another period piece are the sincere performances and beautiful dialogue directly from the pages of Thomas Hardy’s book. Through a series of misfortunes and questionable decisions, Everdene frets between the men, eventually discovering that the one she really loved was there all along, surprising no one. Although the fact that the outcome is so expected could be a mark against the film, it only makes the ending so much more satisfying and makes you emotionally invested. Throughout the film, Everdene learns when to compromise, and when to nurture her stubbornness. Compared to other period pieces it moves at a brisk pace. It is a beautifully presented tale of romance. There will be people who find Far From The Madding Crowd boring, but those who do would probably be watching Avengers: Age of Ultron or San Andreas instead.